Kombucha is a living probiotic tea that helps detoxify the body, energize the mind, and is packed with beneficial bacteria. Kombucha aids the body in healing and restoring gut health and integrity. 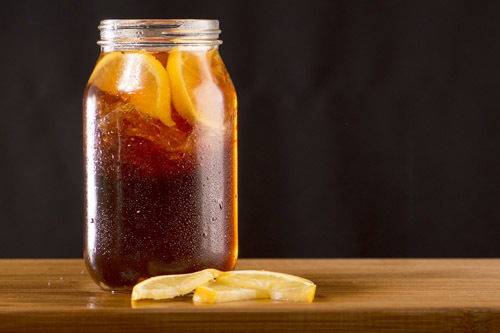 The fermentation process gives the tea a fuzzy effervescent quality, like a natural soda. People who drink Kombucha regularly claim that after one week of drinking kombucha daily they notice an improvement in immune system function and energy levels. Furthermore, within a month of daily consumption, they experience healing of some minor ailments, and healing of more radical illnesses within a year or so. However, eating foods that are toxic and poisonous for our bodies will slow down and prevent your body from healing. So, continuing to eat junk and just adding the Kombucha tea alone will probably not be enough to experience the benefits of drinking Kombucha daily. The best way to heal your body is to lessen as much as possible the toxic things that go into our bodies and are around bodies, and then nourish it and feed it with all it needs to give it every opportunity to rebuild itself. There are so many unique and different health benefits that can come about from using Kombucha. Kombucha tea contains a range of B Vitamins: B1, B2, B6, and B12 which provide the body with energy and helps process fats and proteins, which are vital for your nervous system. Kombucha contains antioxidants that help fight molecules in the body that can damage cells. It has one of the few agents that can cope with the pollutive products of the petroleum industry, including plastics, herbicides, pesticides, and resins. A study done in 2011, found that the antioxidant-rich kombucha reduces toxins in the liver, suggesting that kombucha may play an important role in promoting liver health and reducing liver inflammation. However, these studies were conducted on rats, and more research is needed to say with certainty how kombucha can support liver health in humans. It helps with the structure of cartilage, collagen and the fluid that lubricates the joints. Collagen reduces wrinkles and helps with arthritis. It helps the body to make Glutathione, which is made up of 3 amino acids and is produced naturally in the liver. It is vital for cellular metabolism. It protects our bodies against oxidative stress caused by free radicals and is also required for the immune system to function correctly and is a potent detoxifier. Scoby’s and kombucha tea can be used to treat stings, bites, infections on the skin and rash, irritation, eczema and external fungi (e.g., ring work, nail fungi). Can be used as a probiotic gargle for sore throats and infections. Hand sanitizer or put kombucha on hand soap. Kombucha and Scobys can be added to bath water as the bacteria and goodness absorb straight into the skin. It’s beneficial for sick children, or just a relaxing, nourishing time in the bath. Afterward consider dumping the bath water in the garden, instead of letting all that beneficial bacteria go down the drain. Scoby is useful in garden compost. The bacteria and minerals nourish the soil, and the goodness absorbs into your plants and vegetables. 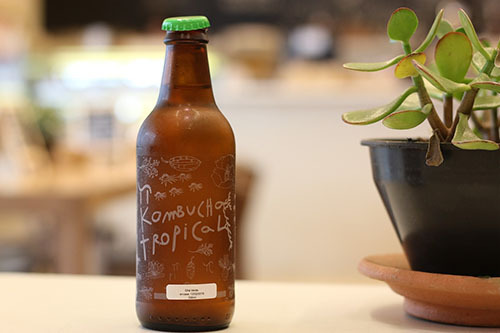 Because of its fermented properties, Kombucha can be used in spray bottles as a probiotic surface cleaner. The SCOBY can be pulverized in a food processor and kept refrigerated to use as face mask applied directly to the skin allowed to leave for 10 mins or longer until dried and absorbed into the skin and thoroughly washed off. The Scoby can be fed to animals. It will assist them with a variety of ailments such as arthritis, gut issues, cancer, skin issues, ear issues, and more. Kombucha will help eliminate fleas and ticks on your pets. However, a stronger batch of Kombucha will be needed for this application. 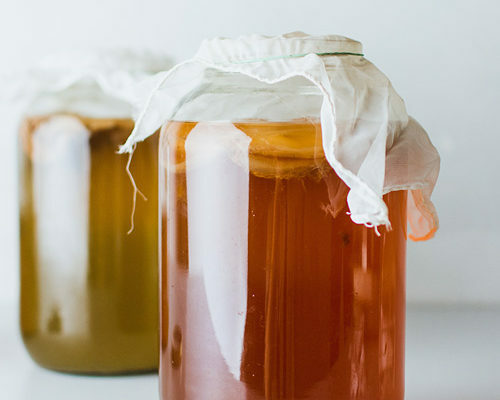 To make a stronger brew, merely let your kombucha ferment for two extra weeks. This will create an extra strength brew, similar to a tincture. Next, apply your stronger brewed batch of flea and tick spray to the affected areas on your dog, cat, or livestock to decrease the irritation and discourage those pesky little buggers. For severe cases, you can also use it as a bath! It will also help them retain a shiny coat. Kombucha is a natural way of getting rid of worms in dogs and cats. Dogs and cats get infected with roundworms by ingesting worm eggs found in soil or stool. Start by giving your pet a dried SCOBY as a chew toy. As you know cats can be very finicky if they refuse the new chew toy try mixing it with their food or in their drinking water. May help ease the symptoms of anxiety, eczema, food allergies if ingested and applied topically. Kombucha is chock-full of trillions and billions of good bacteria that can strengthen the wall of the gut. Vitamin C potent detoxifier and immune booster and enhancer of vitality. Antibiotic qualities which help deactivate viruses. Encourages the intercellular production of energy. After researching the benefits of Kombucha tea for several months and consuming it myself, I have found quite an array of claims and lists of benefits the tea can offer up. But let it be known I have not researched all of these claims individually and I am not suggesting the use of Kombucha tea over anything your doctor has recommended. If you are looking for help resolving any of these ailments or conditions it is always best to consult a doctor not a food blog.